There are sixteen plates laid out in rows and columns in a square pattern on the table. 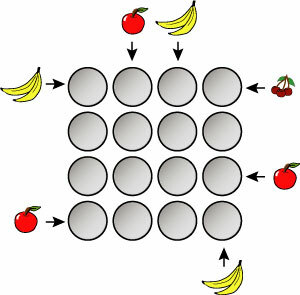 Each row and column has one empty plate, one plate containing an apple, one plate with a banana, and one plate with cherries. No plate contains more than one type of fruit. In the picture above, the fruit outside the grid of plates tell what fruit is closest to you in that row or column when you look in the direction of the arrow. Find out what plates are empty and determine what type of fruit is on each nonempty plate.